I have had a spoon and a fork with a fist symbol in my collection for a very long time. I figured that it was some type of hand signal, but I did not have a further clue. On a whim, I took it to my spoon club where one of the members identified it as a Brazilian symbol for good luck. The web is full of great information and after about 8 different tries with the search engine I was finally able to learn that this symbol is called the Figa fist. 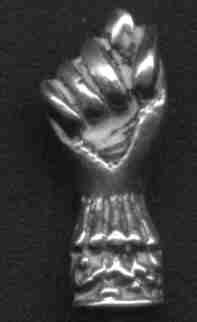 The Figa fist is basically a good luck symbol which traces its roots to African slaves who were brought into the country, but it can also be used for fertility or passion. In some respects it is similar to our symbol of "crossed fingers". In our culture there is a crude hand symbol which is similar but not the same -- this is NOT a crude symbol.